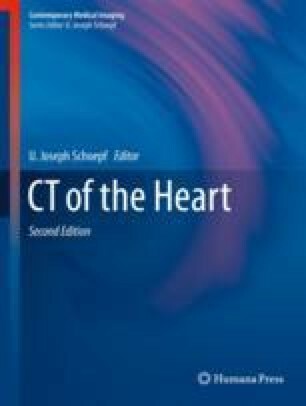 The few patient studies focusing on dynamic CTMPI for myocardial ischemia detection show promising results. Absolute quantification of perfusion parameters offers great potential, not only in the diagnosis of myocardial ischemia but potentially also in the detection of early signs of reduced myocardial blood flow as well as the diagnosis of microvascular disease and three-vessel disease. With the advent of new dose reduction techniques and new developments in CT systems, resulting in faster scanning times and wider detectors, clinical implementation of dynamic CTMPI becomes closer. Tanabe Y, Kido T, Uetani T, et al. Differentiation of myocardial ischemia and infarction assessed by dynamic computed tomography perfusion imaging and comparison with cardiac magnetic resonance and single-photon emission computed tomography. Eur Radiol. 2016:1–12. http://www.embase.com/search/results?subaction=viewrecord&from=export&id=L608199060.